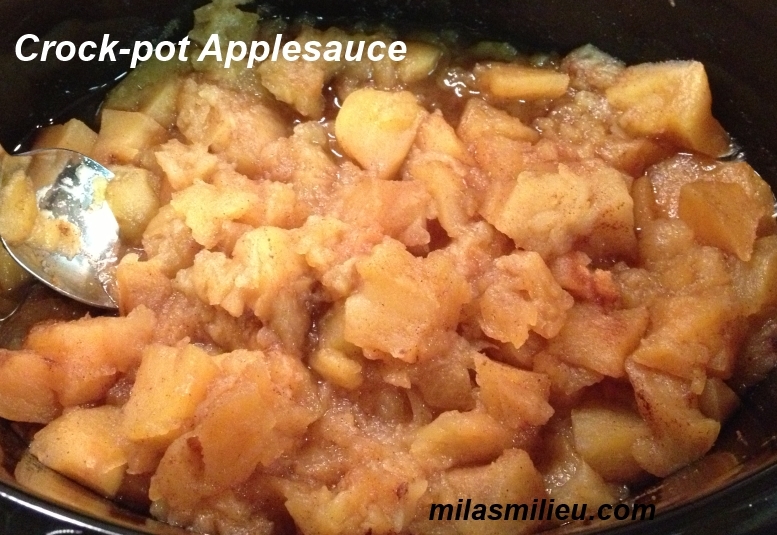 “No sugar added” crock-pot applesauce. 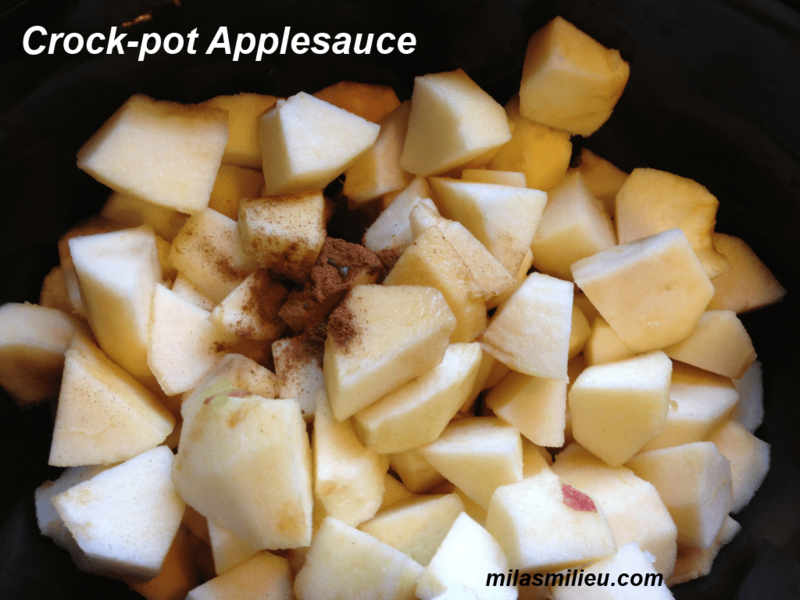 This applesauce requires 5 minutes hands-on time, then about 3 hours in the crock-pot. What you get is unbelievably flavorful and satisfying treat snack. After you make it, you will be asking yourself why you had been buying applesauce at the store. I don’t know what they do to the stuff in a jar, but after trying this home-made applesauce, even all-natural brands taste like hospital food. Apart from being easy and delicious, this applesauce is a fantastic healthy snack option mixed with Greek Yogurt and some low-fat granola: a guilt-free version of apple pie that you can eat every day! 1. Place peeled, cored, and roughly chopped apples in the crock-pot. Add cinnamon and vanilla, if using. Sometimes I add a splash of water (a couple tablespoons), other times I skip that– haven’t noticed any difference. 2. Turn your crock-pot on High. My crock-pot has only two settings for High– 4 hrs and 6 hrs. I start checking after 3 hours, and it is usually ready by then. Note: crock-pots vary, so play around with cooking times a bit. You want the apples to easily fall apart if stirred. 3. Once cool enough to handle, move the applesauce to a container. Clean spaghetti sauce jar works perfect for this! You can leave it chunky, or mash with a fork for more uniform texture. Keep in the fridge for up to 2 weeks (if it’s not already eaten by then:). Sounds fabulous! I got a crockpot about 6 months ago. Haven’t tried applesauce in it, but I have made home-made before, and it is delicious. Never thought to mix it with yogurt, but that sounds fantastic, especially with granola! Pinned! I really like the combo, it tastes like dessert, but is very healthy and filling. Thanks for the pin, Amy!